Open back headphones are known for being some of the best-sounding headphones on the market. This is because there is little to no resonance because the drivers are not covered or sealed in. While there usually is a screen to protect the drivers, there is not a cover to interfere with the deep and authentic sounds users enjoy. While the higher-end products on this list offer a fully open design, the more budget-friendly models turn to a hybrid between an open and close back. This allows for a better level of sound quality without the cost. Open back headphones are easy to spot. The back of each earphone is left uncovered by anything beyond a screen. Some headphones enclose the entire head piece but this can change the way they sound. Leaving the back open means the headphones deliver a more true sound when listening to music and television. This reduces the resonance and muffling sound effect many enclosed sets deliver. The missing enclosure allows sound to travel to the ear without resonance and interference. It also means sometimes the headphones have a higher level of base and treble that produces an authentic experience. 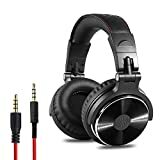 These higher end headphones can be ordered through Amazon or bought directly from the manufactures. There are also many larger electronic stores that sell them. It is important to buy from an authorized retailer to avoid knock-offs. Because of the higher sound quality, these headphones run higher than most. They are priced within the low end range at least. However, some headphones are on higher end which means they can have expensive price tags. 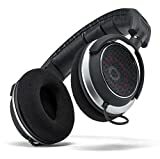 When comparing these models, we wanted to give readers a full range of prices for a great sounding open back headphone. We also wanted to make sure these sets were relatively easy to find and have a solid warranty since many are a sizeable investment. Because the fully open back designs run at a higher price point, we also explored reliable brands that offer a hybrid between a closed and open back design. These products are significantly lower priced. The warranty for the lower-priced products also varied significantly. No matter which price point you settled at, buying an open back headphone is a wise buy. They deliver some of the best sound around, but there are trade offs for buying the lower-priced models. Each pair will deliver great sound but the higher-priced models take sound to the next level. This can be the difference between hearing a fantastic piece of live music and being able to hear in detail each instrument on its own. Key Features of this product include a stylish design made to wear for extended periods of time. The new design is 30% lighter so these headphones are easy to wearing for watching television or listening to music. 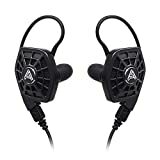 This pair stays true to the quality one expects from this brand as they deliver amazing sound that includes being great for listening to live music. Users report these open back headphones have a wide sound base that means music sounds even better as each instrument stands alone. They balance the sound at 93 dB. They also designed them to deliver a higher level of both treble and base quality due to a larger diaphragm. The manufacturer offers a one year repair or replacement warranty for typical use. 30% lighter than many other headphones in this class. Recent redesign for comfort and long wearing. High-quality sound with a budget price. May not be as durable as more costly models. You can tell just by looking at these headphones they are high end and something special. The combination of wood and metal set them apart. While the 4001s deliver some amazing sound, this headset fine tunes each part of the sound experience. This is due to the "Advanced Asymmetrical Magnetic Circuit" design that produces live music samples you can not tell apart from being there. The design also has the first diaphragm measured in nanometers to support superior sound. This is the only headset of the list to carry a zero distortion label and back it up. They are the top of the line and not something users soon forget. The drivers are open but still protected by a window shade weave that was years in the making. The problem with this headphone is not that there is anything wrong with them, but instead once you try these you may not settle for anything else. They are an investment but many customers report it being one of the best purchases they have ever made. One-year full warranty for either repair or replacement of headset under normal use. They design the circuit for flawless sound. One of the top open back headphones in the market. Pricing puts them out of range for many customers. They can fill the market with imposters. This headset is one of the best budget-friendly open back headphones around. While they may lack the flash of the HiFiMan headphones, they do the job in delivering quality sound. They use a 50mm neodymium driver to support a higher sound quality. The overall design is comfortable enough to use for a few hours at a time. They are also highly sensitive in picking up a variety of sounds so you are not missing anything with this product. Many online reviews point to this being one of the most comfortable headsets Philips makes. The double padding and breathable design helps makes these headphones something you can wear all day. Any warranty work goes directly through Philips with no upfront promise of a year-long warranty like some other headphones. Big sound quality on a budget. May not compare to the HiFiMan in sound quality. The design looks like just an average headset. While this headphone set delivers decent sound, they are actually only partially open. There is a section of the driver that has more protection as you might expect in a closed design. It balances the sound but not really anything special compared to an open back design. The overall look of this set also leaves a lot to be desired. They make them to match the sound quality of an open back without the higher price. They make these headsets durable through long-term usage. They come equipped with a flexible cord connection. It can be swapped out for personal or studio use. They are adjustable and look like a standard headphone. 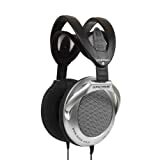 Improved sound quality when compared to a closed back headphone. Easy to find at most electronic stores. Not as fragile as some other designs. A little clunky in design. 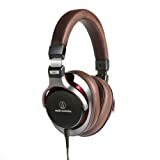 Sound does not compare to higher end open back headphones. This is another hybrid between a closed and open back headphone. The inner magnetic structures add to the sound quality without being as easy to damage as some open designs. The overall look of these headphones is standard, they make them to deliver a partially open sound experience. They are a better sounding headset than something that is fully closed. This design relies on titanium diaphragms that produce a true and accurate sound. The internal working of this headset are a high quality despite the low cost. A meshy type design and the flexible sizing makes this a good fit for anyone that doesn't want a tighter band on their head. It is sturdy enough for work use but also adaptable for use by kids at home. Limited warranty as expected at this price point. Shipping paid by customer and almost makes it worth it to just buy a new pair. More portable than some other products listed. Not truly an open back design. The overall look of the product is fairly plain. Not the best quality, but this is expected at this price point. Samson has been in the business for 80 years, and this dependable studio headphone set shows it. They do not make them to be pretty, but they make them to get the job done. They used a hybrid between the closed and open back to bump up the sound from an average pair of headphones. A wide dynamic range is supported by the 50 mm driver. The over the ear design also helps to isolate sound while in the studio. They are fully adjustable and a solid go-to headset for studio use. They also make studio use easier as they ship with both the 1/8 and 1/4 inch adaptors. The comfortable fit makes them easy to wear to work or play. They also have a frequency response range that goes from 10 Hz to 30 kHz. This is one reason their sound range is so good. Offers some of the best studio range and stereo imaging. Not a full open back. Lacks the quality of the higher end headphones. 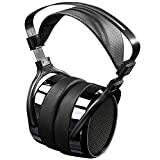 For buyers looking to invest is an amazing set of open back headphones, the HiFiMan HE1000 Open-Back Planar Magnetic Headphones deliver on every aspect of sound. In a perfect world where price is not a deterrent, this the best choice for sound quality you will duplicate nowhere else. Getting beyond the sticker shock is the worst part of these headphones. The other HiFiMan headphone to make the list, the 4​​001, is much more friendly to the budget. It still delivers amazing sound you expect from the open back design. The hybrids on the list offer the average shopper a chance to enjoy the more authentic sound of an open back design without the initial investment. The hybrids on the list have about the same level of sound. Any of these headphones would deliver a higher level of sound quality than an average close back design. Each had a slightly different take on overall design and comfort but the sound was the same. Beyond the sound difference, the styling of the higher-priced made them stand out. For the price they appeared very different from any of the hybrids down to the way they look. The available warranty for the top end models also supported the investment to get that quality. Have you ever wanted to hear sounds that help to set the right mood - bringing back memories of a favorite camping trip, a day at the beach - without having to relive those experiences? We often want to be accompanied by our favorite tunes whether we are on the move or taking a break from the everyday hustle and bustle of life. Bose Bluetooth speakers transport us to happier times without the hassle of wires and cumbersome cords. Bose offers quality sound equipment through innovative technology. Using Bluetooth enabled technology, portable speakers can easily transport us to happier more relaxing times. We have found some of their products that will help fill your life with the sounds you love no matter where you are. After quite a bit of research and fact checking, we have compiled a list of the best Bose Bluetooth Speaker products for you. Bose Bluetooth Speakers are speakers that are wireless and portable. They are the perfect solution for those who want entertainment, whether found in music, movies, or online books, anywhere they go. Because they are speakers and not headphones, they are less ideal for public spaces. However, they are great for rooms without outlets, outdoor spaces, or for situations where the hassle of cords and wires is less than ideal. 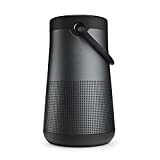 The Bose Bluetooth Speakers connect with other devices such as smart phones, tablets, laptops, etc., through the Bluetooth technology enabled on each. Using the Bluetooth technology, you may play your favorite music and other forms of audio entertainment wherever and whenever you would like. Using the Bose Connect app, any Bluetooth enabled device can then seamlessly play your favorite music or entertainment through the Bose Bluetooth Speakers. The app also offers tips to make the most out of your speaker and will personalize your settings. All your speaker's connections are controllable by a single swipe. No matter where you house your music, movie, or book library, these Bose Bluetooth speakers can play from it. Size: Smaller speakers are more portable while larger speakers are more cumbersome and not as easily transported. Ease of Use: If a product is too difficult or complex to be understand, most people will not purchase the product. Battery life: Because the speakers are wireless, they must hold their charge fairly well. The longer the battery lasts between charges, the longer you can listen to your favorite sounds. Charging system: Some charging mechanisms limit where and how easily you can charge your device on a day-to-day basis. Price: The cost of any product, as we all know, heavily affects if and who will buy it. Some products may be far too expensive for some and therefore limit its clientele. It also needs to be comparable to other similar products offered by competing companies. This futuristic speaker is the embodiment of the strides technology has made. If you want to listen to music but not shut out everything else around you as do with headphones this is the speaker for you. This wearable speaker offers you both comfortability and convenience allowing you to engage with both the music and your surroundings. The speakers sit right below your ears, offering sound to only you or those very near to you. There is a three-button control that allows you to turn the volume up or down, play or pause, talk to Siri or take a call easily. It has 12 hours of battery life and can take up to three hours to charge completely. It has a micro-B USB port to charge when needed. And is compatible with Bluetooth for up to 30 feet. This model has a great sound quality, is convenient, comfortable, sweat and weather resistant, and comes with a padded cover that is static free to prevent hair and clothing from clinging to it. The SoundWear Companion is only made for one person. It is also fairly expensive compared to some other models that offer a lot more for a lot less. The Sound Revolve+ Bluetooth Speaker was engineered to spread sound in every direction. With a downward facing transducer that works with an omnidirectional acoustic deflector, 360 degrees of sound is delivered with no dead spots. It has a flexible fabric handle so you can easily carry it wherever you wish. And with a weight of only two pounds and a height of 7.25" it is even easier to take with you on the go. It has a soft bumper like exterior that prevents it from breaking if you accidentally drop it. It is water-resistant, has speakerphone abilities and has a multifunction button for easily access Siri and Google Now. The SoundLink Revolve+ has a battery life of up to 16 hours and has a USB port, USB power cable, and AC power adapters. 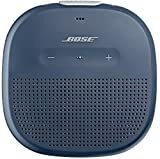 As one of the best Bose Bluetooth speakers it has a great sound quality and is durable and water resistant. The fabric handle makes is extremely portable as does its size. This is the top of the line for Bose's Bluetooth speakers so they are expensive. This speaker produces unmatched sound for its size. It is a mere 3.87" high and wide and only 1.37" deep and only weighs 1.5 lbs making it the most portable Bose Bluetooth speaker available. You can take it anywhere. It has a tear resistant silicone strap allowing you to attach it to just about anything. It is also not just water resistant but waterproof. The exterior is a seamless rubber silicone made to protect it from any falls or drops it may take. The custom-designed transducer and silicone passive radiators work to maintain a higher sound quality better than any other speaker of its size. It has a battery life of around 6 hours and uses a USB port for charging. 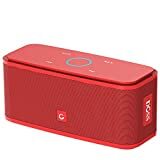 It also has all the technology that the larger Bluetooth speakers have including the multifunction button that allows for voice recognition apps connection and speakerphone. This small model seems to have it all: quality sound, is waterproof, durable and has more technology built in than most speakers three times its size. It is also very affordable for all that it seems to offer. Since it is smaller, it may not offer sound as loud as some other models. This speaker's small size of only 1.5 lbs and only two inches tall lets you take and place it about anywhere. It's low profile and center of gravity make it hard to topple over. It has a built-in microphone that can be used for taking calls, connecting to voice recognition app and switching between your devices. This speaker will remember up to eight Bluetooth compatible devices. It is water-resistant and has a tough exterior for durability. The rechargeable battery gives you up to 10 hours of playtime. It comes with a charging cradle and a wall charger. Bluetooth is available to to 30 feet away. The SoundLink Mini II comes with a protective case in five different colors. We like that this is small and water resistant, and that it can remember devices for easy use. It is a little expensive, especially compared to some other speakers that Bose offers and it is not as rugged either. The SoundLink Color Bluetooth speaker II has been made using dual opposing passive radiators that pump out sound while maintaining vibrations to a minimum. Its soft-touch silicone exterior also helps with the vibrations so you can play it as loud as you want without it rocking it off of any surface it is sitting on. This also makes it water resistant. The SoundLink Color can remember up to eight Bluetooth-enabled devices and, like all the other speakers listed here, it has a built-in microphone to take calls and connect to a virtual assistant. As one of the lightest Bose Bluetooth speakers, weighing in at only 1.2 pounds, it easy to carry, supported by its rounded design. The rechargeable Lithium ion battery gives you up to 8 hours of sound without missing a beat. It is charged with a USB cable and also has a 3.5mm auxiliary port. We note that this model is small, light and has a great sound quality and all the other great technology we have come to expect from Bose. This model has a shorter battery life than most of its companions. 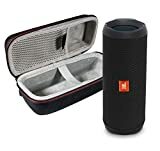 It has a long battery life, is durable, has quality sound, and has multiple functions for a speaker that is smaller compared to most on the market for its purposes. 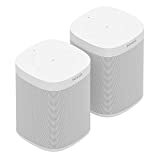 While it is designed for travel and personal use, it cannot compare easily with the other Bose Bluetooth speakers because it is made for professional use as well. It is large and not nearly as portable as most of its counterparts. It is also expensive. After careful consideration and extensive research we have concluded that the SoundLink Revolve Bluetooth speaker is the best Bose Bluetooth speaker for its sound quality. While it does everything the slightly larger Revolve+ does, it is almost cheaper. Other models may be cheaper but as the price goes down so too does the size and therefore the amount of sound it can put out. This speaker produces high-quality 360 degree sound, it is lightweight, has a long battery life, durable and water resistant. 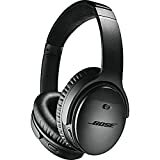 Its accessibility to the Bose Connect App, virtual assistants, and a speakerphone are important qualities to note. 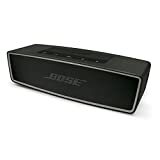 For the price we believe you will get the most for your money with this Bose Bluetooth speaker. If someone asks you, “what is sound?” could you answer the question? Most of us, if we're honest with ourselves, may know a few fundamental things about sound. However, at the end of the day, the majority of us have only skimmed the surface or recall bits and pieces from elementary school. I know, you're nodding your head right now. Now, whether you are a musician, an audiophile, or someone who is merely obsessed with sound, you are in the right place. We are about to break it all down and finally answer the question, “what is sound?” in its entirety in a way that everyone can understand. After you read this article, shopping for new sound equipment will be a piece of cake. To answer the big question, we are going to have to start small. Generally, the “medium” that ends up disturbed by the wave is the air, but sound can also travel through solids and liquids as well. An essential thing to remember here is that just because you can't see a soundwave, doesn't mean that it isn't physically there. Now that you understand what a soundwave is let's talk about how the human ear manages to pick up those sounds. The change in pressure hits the human ear, and that's what produces a sound. Sound hits your outer ear first. Then, the outer ear works to funnel that sound through your ear canal. Once the soundwave hits your tympanic membrane (eardrum) in the middle ear, it causes it to vibrate. Once the soundwave hits those bones, they transmit vibrations from your eardrum to your inner ear. Then, the soundwave gets into your inner ear, and the cochlea there convert the vibrations into nerve impulses. Finally, your auditory nerve receives those messages, already translated into nerve impulses, and carries them into your brain which is where your brain turns them into sound. As you can see, the human ear is capable of an astounding number of processes, and they all happen almost instantly. Next, it's imperative that when someone tries to answer the question, “what is sound?” that they also understand the power of sound. You should never underestimate the power of sound. Amazingly, Hans Jenny, a Swiss medical doctor, pioneered research that showed each sound produces a unique geometric shape. Author of the book Messages from Water, Dr. Emoto studied the formation of crystals in water as he exposed the water to different sounds. When Dr. Emoto played nice things like Mozart, prayers, and positive affirmations, beautiful crystals grew as a result. However, when Dr. Emoto played or yelled mean things like, “I hate you,” and, “I will kill you,” the resulting crystals were deformed and ugly. So, as you can see, sound effects every human daily in more ways than most of us can imagine. Now that you understand the power of sounds let's talk quickly about the speed of sound. While the speed of sound is a constant, certain variables will affect how fast the soundwaves can move. On average, though, the speed of sound through air is around 1,130 feet per second or approximately 750 miles per hour. Next, when it comes to measuring a sound wave, how fast it's going is not quite as crucial as other measurements — like volume and pitch. Let's find out how you measure those. First, the amplitude is the measurement of how powerful the wave is — which translates into how loudly the human ear hears that sound. In other words, amplitude equals volume. You measure the amplitude of a sound wave in decibels or dBA, and it defines the amount of pressure emitted by the wave. You may also hear it called Sound Pressure Level or SPL. For humans, sounds that are 85 decibels or higher have the potential to damage your ears permanently. As the sound pressure (amplitude, volume) goes higher, the time it takes to damage your ears goes down, so be careful. For example, sounds at 85 decibels will take up to eight hours to cause any damage while sounds over 100 decibels can cause damage after only 30 minutes. Now, for recording artists and musicians, understanding decibels on your equipment is a little more involved than just understanding what they measure. First, most of us understand units of measurement on a linear scale, and decibels don't work that way. You can find the chart from the video if you click here. If you want to answer the question, “what is sound?” the next thing you need to understand is the frequency of the sound wave — or the pitch. The frequency of a sound wave is the measurement of how far it is between the peaks of the wave. To measure the frequency, you want to measure the number of sound vibrations in one second. The unit of measurement used to define the frequency (pitch) is Hertz. However, since it is 2019, instead of getting all that expensive equipment, you could just download an application like dB Meter to your smartphone. Starting from 1880 to the 1920s, Thomas Edison, Magnavox, and Victrola all used horns as the earliest means of manipulating sound. Unfortunately, the horns alone could not amplify the sound all that much. So, In 1906, a man by the name of Lee De Forest invented the first audio amplifier using a triode vacuum tube. Then, in the 1970s, silicon transistors replaced the vacuum technology used in amplifiers. While you can still find tube amplifiers today, most people prefer the transistor types because they are smaller and more efficient. On top of that, the transistor types of amplifiers are also better at reducing distortion levels, and they are much cheaper to produce than the tubed versions. Now that we are starting to answer the question, “what is sound?” we need to dig in and find out how wattages affect different equipment. Generally, you can compare watts to miles per hour — watts measure how fast the electrons move “down the highway,” or the circuit. Unless the speaker is self-powered, the wattage rating listed there is the maximum number of watts that the speaker can handle. For example, if you have a 200-watt speaker and you attach a 250-watt amplifier to it, you're going to blow the speaker. Amplifiers process sound and you measure the output with watts. You can find the output of any amplifier listed right in the specs. Again, make sure that your amplifier isn't pushing more power than your speakers can handle, or you risk damaging your equipment. Speakers work by translating an electrical signal into an audible sound. Now, that electrical signal can be an amp, stereo, microphone, or even these days a Bluetooth connection. Speakers contain a permanent magnet as well as an electromagnet placed beside it. The electromagnet is a metal coil that generates a magnetic field when the electric current flows through it. The coil doesn't act exactly like a regular magnet, however. Instead, as the pulses of electricity go through this electromagnet, the direction of the magnetic field changes rapidly. Then, as the electromagnet's field changes, it alternates between attracted to and repelled from the permanent magnet, which causes rapid vibrations. Those vibrations create a soundwave. However, to get the sound outside the speaker, you need a few more parts. The electromagnetic coil is also attached to a cone made from a flexible material like paper or plastic. That cone amplifies the magnetic vibrations and pumps out the sound waves into the air and then into your ears. Finally, concerning the cone the magnet uses to get the sound out there — many speakers have more than one. To reproduce the many different frequencies of sound within a piece of music faithfully, high-quality speakers have different sized cones in them. You see, with a different cone assigned to the high, mid, and low frequencies in a track, you are going to hear much more than you would from a speaker with only one cone. When you hear people speak about music equipment, you will often hear the terms bass, mids, and highs (treble) — those words describe the frequency. Frequency ranges are not an exact science, so those numbers are estimates only. To answer the question “what is sound?” you must first understand how frequency works when it comes to your sound components and equipment. Let's find out what that means. You will see frequency response listed in the specifications for a ton of different products like speakers, headphones, amplifiers, receivers, and CD players. To put it simply, the frequency response, “describes the range of frequencies or musical tones a component can reliably reproduce. In other words, the frequency response is how well that particular component can reproduce the sounds we are capable of hearing. While he was talking about headphones in the video, frequency response works in generally the same way across all equipment. Additionally, while many purists go for a flat frequency response, some people prefer things like a bass boost, and that's okay too. Before you can honestly answer the question, “what is sound?” you have to get a few more things straight concerning speakers. First, it's vital that you understand that when you hear the term, “speaker,” that's describing the entire piece of equipment, housing and all. However, when you hear the terms, “driver, box, and crossover,” those describe the critical stuff that produces the sound. Sometimes, a speaker will contain many different drivers in one box, and at other times there are only one or two. However, depending on what you need the speaker for, that's very much on purpose. Next, we are going to find out what the different types of speakers are as well as the best uses for each of them. As you learn and read about speakers, you will see them called passive, active or powered. First up, we have the most popular type of speaker on the market: the dynamic speaker. A dynamic speaker is usually a passive speaker. Next, another favorite type of speaker for audio enthusiasts, especially the ones that like those low frequencies, is the subwoofer. A subwoofer generally has one large woofer driver that produces low-frequency sounds as well as a port on the box to enhance them. If you are shopping for a general speaker that produces a full range of sounds, a subwoofer isn't the one for you. However, if you need to add a little more bass into your life, you're looking for one of these. Next up, let's talk about horn speakers. You might recognize the most common type of horn speaker from places like sporting events. Horn type speakers have a lot in common with dynamic speakers when it comes to the drivers they contain as well as the frequency ranges. Electrostatic speakers feature one driver and a super-fine membrane over two conductive panels. This setup results in a crisp, detailed sound for mid and higher frequencies — not so much for the lows. This type of speaker comes with an outside power source, and you keep them plugged into a power outlet. An ideal setup will contain both electrostatic speakers as well as dynamic speakers or a subwoofer for added bass. Finally, we have a speaker design that produces quality highs and mids like the electrostatic speakers — planar magnetic. A planar magnetic speaker uses a long metal ribbon suspended in between to magnetized panels. This type of speaker is ideal, again, for producing precision high-frequency sounds, but if you need some bass, you will need s subwoofer or a dynamic speaker as well. On this mission to answer the question, “what is sound?” you have learned the different types of manufacturing techniques for speakers. Next, let's take a look at the most popular speakers on the market and find out what they' do. Now, we talked earlier about how many audiophiles prefer a flat frequency response. Well, for a musician or music producer working on recording and mastering music, a studio monitor is essential. Like we already discussed, most speakers have components in them that will enhance some of the frequencies. However, you also learned that every different type of speaker has different settings. So, when you are recording a track, you need to make sure those levels are as close to precisely what we hear with our ears as possible. That way, when those other speakers play that mastered track, the levels are where they need to be. So, to do that you need to listen to the soundwave on speakers that will reproduce the sound as flat as possible and that's what studio monitor speakers do. Some manufacturers sell studio monitor speakers as a set, and some of them sell one at a time — so keep that in mind when you're shopping. When computers first popped on the scene, they came with tiny little internal speakers attached to the motherboard. Well, the current generation of computer speakers come these days with a 2.1 system. A 2.1 system means the speakers include two loudspeakers as a subwoofer. Computer speakers are plug-and-play and often attach to your computer using a USB. Next up, if you are designing a home theater or other home sound system, you want to think about a floor standing speaker. Provided, of course, that you have enough space. You see, these speakers are around four feet tall, so if you live in an apartment, you may need something a little smaller. You can get floor standing speakers in many different configurations with different drivers and such depending on your needs. The majority of these speakers are passive or unpowered, so you're going to need a receiver or an amplifier. Now, if you don't have room for those floor speakers, don't worry. You can always get yourself some slightly smaller bookshelf speakers. Bookshelf speakers are medium sized speakers that come in many different configurations. This type of speaker is directional, which means that to get the full effect, they must face you and you will need an amplifier or a receiver to make them work. Finally, we end our list of the most popular types of speakers with the creme of the crop — surround speakers. If you want to have your home theater system sound like you are at the movie theater, a surround system is for you. A surround system places several speakers in the room and works to create a 360-degree sound environment. These types of speakers use multiple channels as well as different drivers to deliver sound to every corner of a room. Of course, at some point, you are likely going to run into some issues with your equipment. Finally, we will round out our lessons helping you answer the question, “what is sound?” with a short chat about manipulating sound waves on your computer. So, you finally got all the speakers and recording equipment you need, so what's next? Well, if you want to record at home, you are going to want to grab a software program so you can master your work before you send it out. These days, you can even get a ton of audio editing programs for free. Now, the next time someone asks you the question, “what is sound?” you are 100 percent ready to blow their minds. Most importantly, the next time you're reading the specs on a piece of sound equipment, you're going to know exactly what those numbers mean.